For a cave exploration of this nature, in a dangerous environment, the proper equipment was essential, in order to better protect the team and visitors to the labyrinth. Public funds were not forthcoming, and the only payment the team received was for copies of colour photographic slides which had been taken. But the speleologists being members of a Scout Group in Malta, helped no end as climbing and caving equipment was readily available for loan. Below are pictures of some of the major original pieces of equipment which we used, much of which has been lovingly preserved. The team was grateful for loan of helmets from the Royal Air Force and field telephones from Civil Defence. 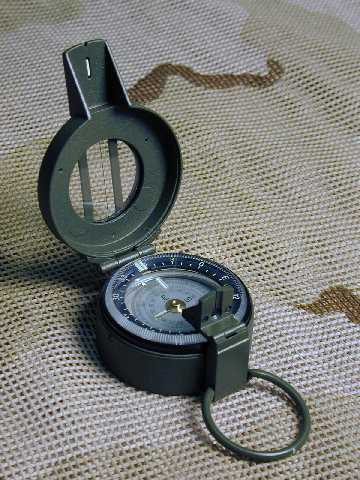 The original Military M-88 Liquid Compass which was used to survey the Ghar Mirdum cave system. It is liquid filled for needle stability and fast reading, has prism sighting for highest accuracy and precision sapphire bearing. The compass was encased in a home made wooden sighting devise with all brass and copper fittings to prevent inaccuracy of readings. 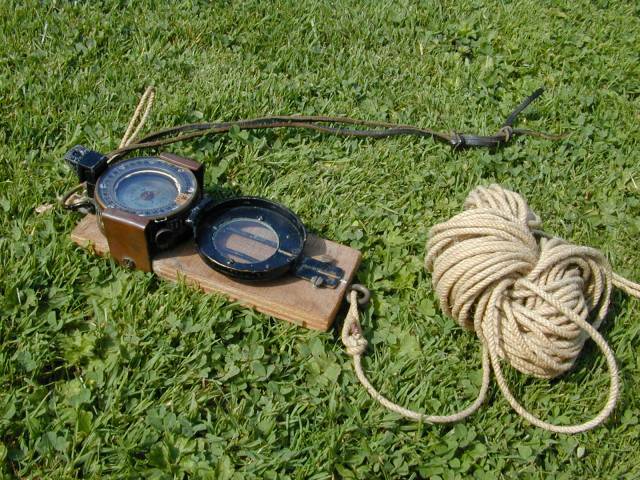 Compass was placed at a 'sighting' peg and the string reeled out to a second 'survey' peg. Readings and measurements between pegs were taken at regular intervals. 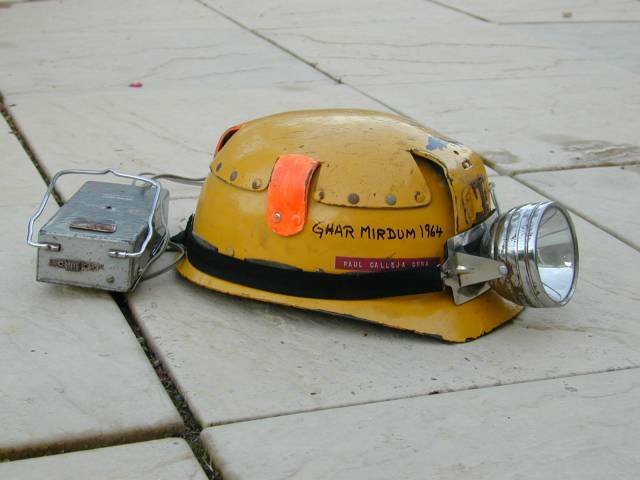 Carbide lamps, both large hand-held and smaller head-lamps were used throughout the exploration and excavation of Ghar Mirdum. 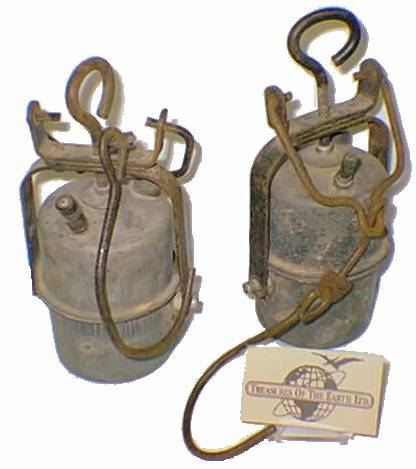 Below is a diagram of the workings of these lamps, which use lumps of carbide. When water droplets touch carbide it emits gas which can be lit in front of a small reflector. The effect is quite a powerful light. 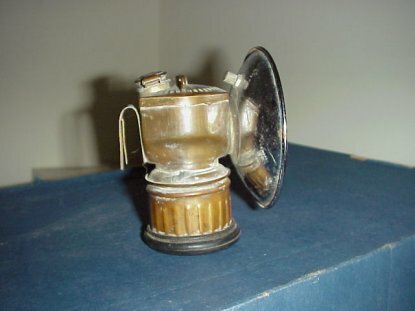 A small carbide lamp which fitted on to the fibre caving helmets. These are still in use today by professional cavers. Mining & Caving safety lamps are available from several sources. One such is www.jkdey.com a manufacturing company in India. Diagram of the workings of a Carbide Lamp. 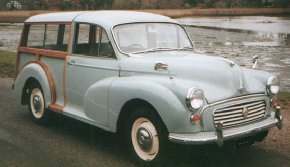 The faithful smoke-grey Morris Traveller which was used throughout the exploration. The large hatch back was ideal for carrying all the equipment and findings to and from Valletta, and the Scout Headquarters in Sliema. 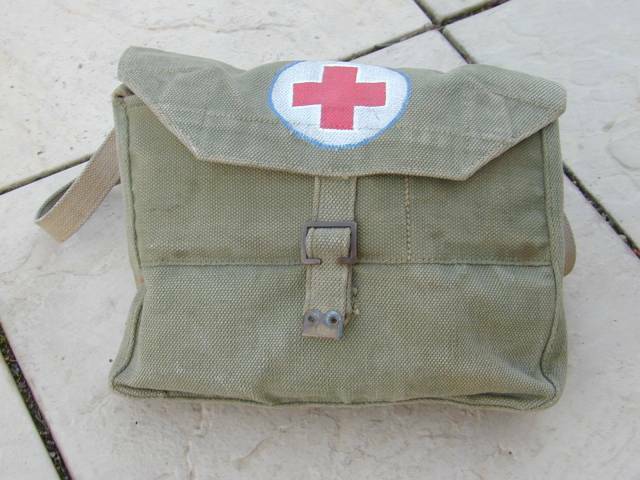 First Aid kit was always present, but thankfully it was not often used. This was in the days before Health & Safety, when health and safety was always considered very important anyway. 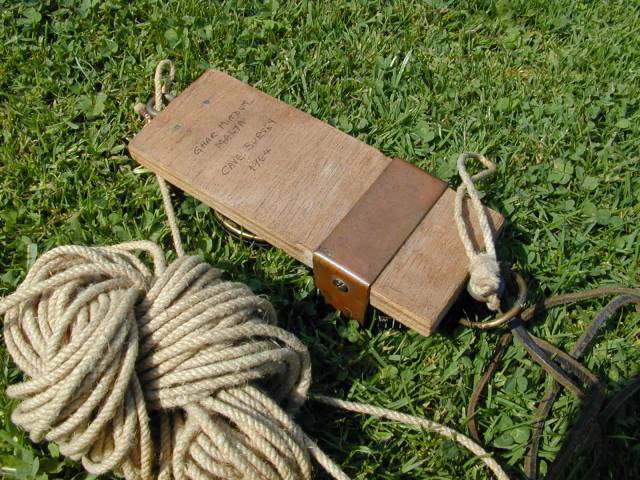 Rope, mostly nylon, was used in great abundance and for a large variety of purposes. It was used for climbing down the cliff to the cave entrance, securing the ladders in place inside the cave, as a safety line with harness for people, and for hauling sacks of artefacts to the surface. 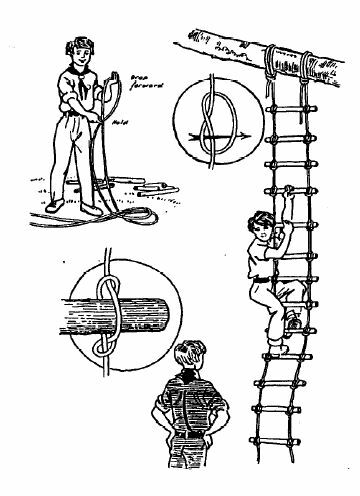 Rope Ladders. 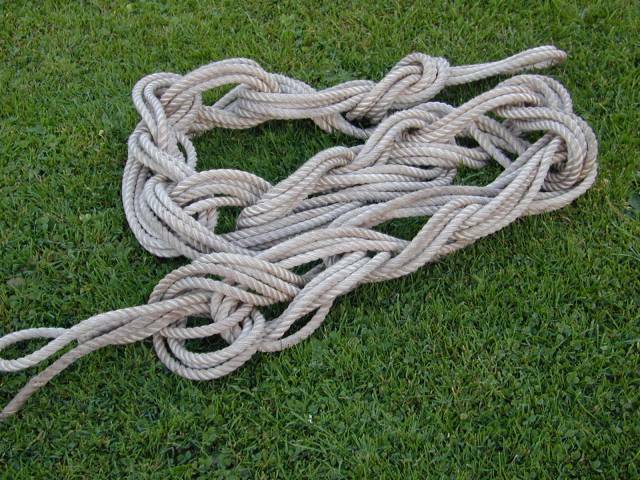 The ones used were ex-Navy, and made mainly from 4-strand manila rope with wooden rungs, and came in 25 foot lengths which could be hitched together. We later purchased a 30 foot Electron Ladder which is strong, durable, if a little uncomfortable to climb. 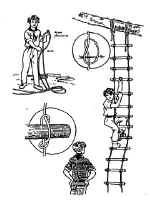 Unlike a standard stiff ladder, rope ladders are best climbed from the side. This provides less out-swing than climbing 'flat'. Fibre Caving Helmets were essential for the safety of the team. This is one of the original helmets, with one of the few battery operated head-lamps then available. 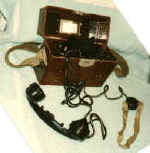 A Civil Defence field telephone with lengths of cable were essential to allow teams in the cave to communicate with the outside world. The system was left in situ for several months.